Mark Jackson combines Elizabethan-era politics with national security themes. Mary Stuart is a near perfect play. Director Mark Jackson may not have a signature style per se, but there are definitely certain features that characterize each of his productions. He tends to favor great-booksy texts, for one thing. Like Goethe's Faust, which served as source material for Jackson's 2009 work, Faust, Part 1 — arguably the best local play of the year. He likes darkness and sordidness, stark soundscapes, and sets that aren't too crowded with detail. He likes the actor Peter Ruocco, who played a seductive devil in Faust, Part 1, and returns in Jackson's current production of Mary Stuart. Above all, he likes characters who are imprisoned, either by the state or by their own minds. Such is the foundation for Stuart, a new Shotgun Players production adapted from the script by 18th-century philosopher Friedrich von Schiller. In essence, it's a rewrite of a rewrite. Schiller's idea was to recast the oft-maligned Queen of Scots as a martyr. Jackson's idea was to create a dueling-queen story with modern parallels, not only in terms of the petty jealousies that inform political policy, but also in terms of national security and the prison system. By dint of luck, or impeccable timing, this run of Mary Stuart coincides with the first civilian trial of a former Guantanamo detainee. The bright lights and security videos in Nina Ball's set seem entirely apropos, as do the characters' vague references to enhanced interrogation. "We don't torture," insists the queen's chief advisor Lord Bailey (Ruocco). During last Saturday's performance, the line drew snickers. It helps to know a little bit about the history of Mary Stuart going in. To an outsider, it can be extremely convoluted. The gist is that Mary, the 16th-century queen of Scotland (and erstwhile queen of France, per her first marriage), was defiled in Protestant England for steadfastly clinging to the Catholic faith. She also had a checkered past, having issued a few backroom deals (like her attempt to secretly consolidate the French and Scottish thrones against the will of her subjects) and married the man widely rumored to be her first husband's murderer. All of these details emerge as random kernels in the characters' dialogue. Given the weird mix of ambitions and side plots against Mary, it's occasionally hard to tell what's true and what's hearsay. Still, if you can keep track of who's a good guy, who's a prevaricator, and who has an evil plan, the rest will gradually unfold. 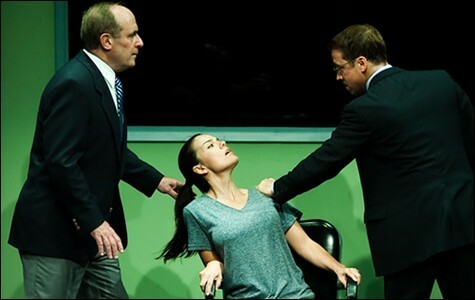 Jackson staged this Mary Stuart in a hyper-modern setting. Three video screens atop the stage show characters' movements, as they stand in a hall behind the stage. The walls are brutal prison-white. 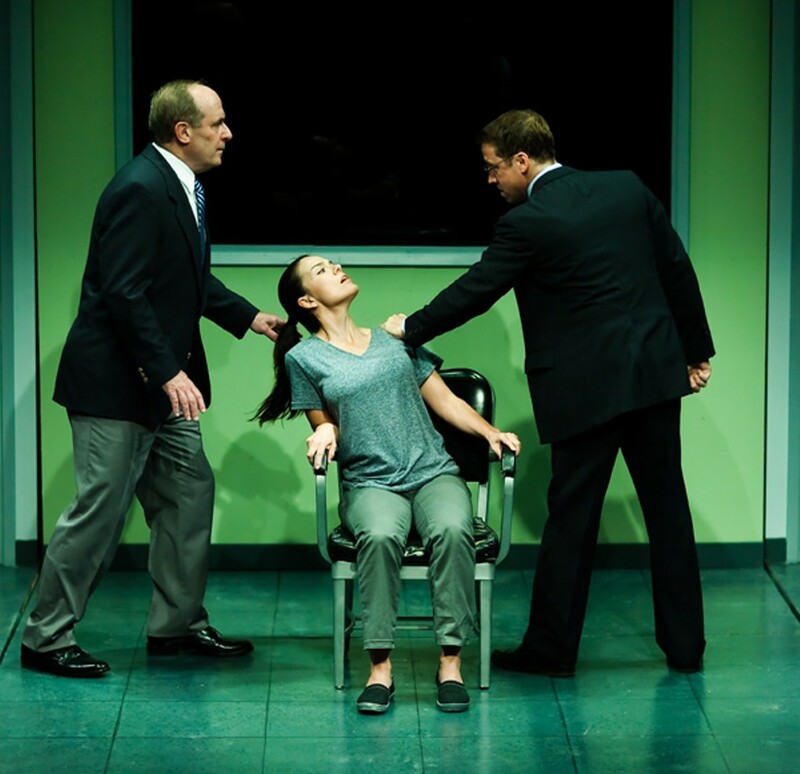 For most of the play, Mary (Stephanie Gularte) sits in a chair in the center of the stage, curled in a fetal position. Characters watch her movements from behind a dark window in the back of the room. The window also reflects Mary's silhouette, creating the illusion of two planes of action, even when she's the only one moving. The opening scene is built around long stretches of silence during which Mary's face is projected on the three video screens in close-up. Gularte has the perfect face for such invasive techniques: long and narrow, with high cheekbones and sharp, slanty eyebrows. A clock ticks petulantly in the background. The whole set is an extension of Mary's psychology. The title character actually gets few lines of dialogue in this play, even though she's the subject of every single conversation. Elizabeth (the wonderful Beth Wilmurt) enjoys a rather tenuous sovereignty over England, knowing full well that the defamation of Mary Stuart will help burnish her own reputation. Jackson codes this Elizabeth as an androgynous character in contrast to the doe-eyed, feminine Mary. Wilmurt is made to look extra pale, with military cadet boots and a navy blue blazer. Colors of the English flag predominate in the other characters' costumes as well. Lord Burleigh, the Earl of Shrewsbury (John Mercer), and the Earl of Leicester (Scott Coopwood) all wear politician suits and ties. The warder Paulet (Jesse Caldwell) and his nephew, Mortimer (Ryan Tasker) have laminated badges. Burleigh wears a flag pennant. Aside from being the most overtly nationalistic and anti-Catholic character in the play, Burleigh is also the most pure villain. Unlike Leicester, Mortimer, and Elizabeth, he doesn't waffle or bask in self-doubt. He's never vague about his intentions. And, in Ruocco's portrayal he's a real chain-of-command kind of guy. Casting aside the set design and historical subtext, Ruocco is by far the best reason to see this play. If you liked him as the devil in Faust, Part 1, you'll salivate over his depiction of a Rovian 16th-century lord. Ruocco plays Burleigh with his whole body, sucking his cheeks in and licking his teeth when he's angry, or clasping his fingers to emphasize a point. Not once does he step outside the role, or even make a frivolous body movement. Mary Stuart can seem like heavy lifting from an audience perspective, especially trying to follow all the character relationships. Once you get the historical nuts and bolts, it's a near-perfect play.